Please visit our fabulous sponsor this week, Sasayaki Glitter, to see all of their wonderful products! 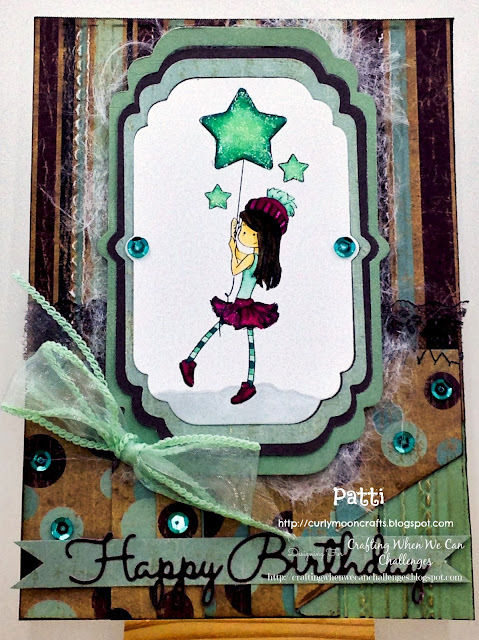 My creation for this week is a birthday card using the lovely Anita's Star digital image. Here's a close-up of the image, so you can see the glitter and shine in the balloons and her clothes. I printed the digital image onto smooth white cardstock and colored her with my Spectrum Noir markers, using colors that matched the papers I chose. I chose these KI papers because they had both a lovely striped and circles paper. I trimmed the papers to fit my A7 card base, then used a striped embossing folder on the striped paper to enhance the texture. I used a pleat fold on the circles paper, then stitched the top edge with my sewing machine and added some lace colored with the SN markers. After I adhered all the background papers, I used a framelits die to cut the image and frames, then used some fun foam to pop the image off the center of the card. I used some Glossy Accents and glitter on the stars, then used the clear SN Glitter brush pen on her clothes/hat. I cut my sentiment from the same papers and added it on a banner at the bottom of the card. To finish, I added a ribbon, some sequins, and some tattered/used dryer sheet behind the focal image.